An onside kick can be used at any time to create a big play, but usually these kicks are employed when the game is on the line and the kicking team desperately needs the ball in the hands of its offense. For a soccer-style kicker, the sweet spot of the ball is about 1 ½ to 2 ½ inches down from the ball’s widest segment. From punting to the corner, to out of the end zone, situations and objectives differ when punting a football. Whether they realize it or not, kickers and punters are constantly preparing to succeed by first seeing the results of their efforts before they ever kick or punt the ball. Huddle up with one of the greatest players in football history as he shares the techniques, strategies, and secrets of kicking and punting. So whether it’s pinning your opponent inside the 20 or drilling that last-second kick through the uprights, let Football Kicking and Punting elevate your play and ensure winning performance. Coming out of the University of Southern Mississippi, Ray Guy was the first pure punter ever to be drafted in the first round of the NFL draft when the Oakland Raiders selected him in 1973. Guy was a key member of three Super Bowl-winning Raiders teams: Super Bowls XI, XV, and XVIII. During his career, Guy played in a record 207 consecutive games, averaged 42.4 yards per punt for his career, had 210 punts inside the 20-yard line, led the NFL in punting three times, had a streak of 619 consecutive punts before having one blocked, had a record 111 career punts in postseason games, had five punts of over 60 yards during the 1981 season, and never had a punt returned for a touchdown. Guy was selected to seven AFC Pro Bowl teams, and in 1994 he was named the punter on the National Football League's 75th Anniversary Team. Guy was also an outstanding punter and placekicker at Southern Mississippi. During his senior season, Guy recorded a 93-yard punt while leading the NCAA with a 46.2 average. As a placekicker at Southern Mississippi, he kicked a then-record 61-yard field goal. Guy was also a starting safety in college and intercepted a record eight passes. He was a consensus All-American, which included being named to the prestigious Walter Camp All-America Team. After his senior season, Guy was named Most Valuable Player of the annual College All-Star game, in which an all-star team of college seniors played the current Super Bowl champion. Guy has been inducted into both the Mississippi and the Georgia Sports Halls of Fame, the National High School Sports Hall of Fame, the College Football Hall of Fame, and the American Football Kicking Hall of Fame, and he was the first pure punter to be nominated for enshrinement in the Pro Football Hall of Fame. Guy was known for punts with a high hang time—sometimes as long as six seconds—and once punted the ball with so much hang time that the opponents pulled the ball and had it tested for helium. 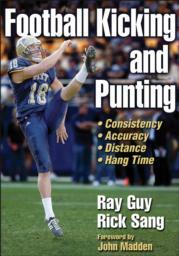 As the cofounder and director of the Ray Guy Prokicker.com Academy, Rick Sang is a veteran with over 29 years of experience establishing kicking instructional programs at colleges and universities across the country. This program has produced two Lou Groza Award winners, numerous college All-Americans, and several NCAA and NFL record holders. A former college coach, he was a member of both Eastern Kentucky University NCAA Division 1AA national championship teams (1979 punter and receiver, 1982 kicking coach) and a kicking coach for Arizona State's 1986-87 PAC-10, Rose Bowl, and Freedom Bowl championship teams. During his coaching career, he had a punter win an NCAA national net punting title and a kicker set a record of five field goals in one game. He is a member of the American Football Coaches Association and the Greater Augusta Sports Council.